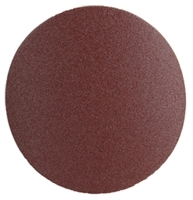 Applications: Plain backed sanding discs can be supplied to order for customers to fix to their machinery either machanically, such as by using clips, or with suitable adhesive. Sizes from 19mm to 810mm diameters can be supplied. In many diamters we can also accommodate centre holes. Paper Backed Abrasives: Aluminium oxide, zirconium, silicon carbide. Plain backed discs are cut to order. Please contact us with your requirements and we will be pleased to quote. Also Available: We supply suitable spray adhesive for discs.